The Mayo Clinic conducted a multisite, double-blind trial on the effects of American Ginseng on cancer-related fatigue. 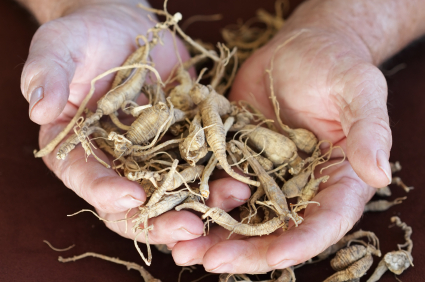 364 patients at 40 different institutions, were given 2000Mg of American Ginseng daily or a Placebo for 8 weeks. The results were posted at PubMed.gov, below is a copy of the publication. J Natl Cancer Inst. 2013 Aug 21;105(16):1230-8. doi: 10.1093/jnci/djt181. Epub 2013 Jul 13. Barton DL, Liu H, Dakhil SR, Linquist B, Sloan JA, Nichols CR, McGinn TW, Stella PJ, Seeger GR, Sood A, Loprinzi CL. Safe, effective interventions to improve cancer-related fatigue (CRF) are needed because it remains a prevalent, distressing, and activity-limiting symptom. Based on pilot data, a phase III trial was developed to evaluate the efficacy of American ginseng on CRF. A multisite, double-blind trial randomized fatigued cancer survivors to 2000mg of American ginseng vs a placebo for 8 weeks. The primary endpoint was the general subscale of the Multidimensional Fatigue Symptom Inventory-Short Form (MFSI-SF) at 4 weeks. Changes from baseline at 4 and 8 weeks were evaluated between arms by a two-sided, two-sample t test. Toxicities were evaluated by self-report and the National Cancer Institute's Common Terminology Criteria for Adverse Events (CTCAE) provider grading. Three hundred sixty-four participants were enrolled from 40 institutions. Changes from baseline in the general subscale of the MFSI-SF were 14.4 (standard deviation [SD] = 27.1) in the ginseng arm vs 8.2 (SD = 24.8) in the placebo arm at 4 weeks (P = .07). A statistically significant difference was seen at 8 weeks with a change score of 20 (SD = 27) for the ginseng group and 10.3 (SD = 26.1) for the placebo group (P = .003). Greater benefit was reported in patients receiving active cancer treatment vs those who had completed treatment. Toxicities per self-report and CTCAE grading did not differ statistically significantly between arms. Data support the benefit of American ginseng, 2000mg daily, on CRF over an 8-week period. There were no discernible toxicities associated with the treatment. Studies to increase knowledge to guide the role of ginseng to improve CRF are needed. I have been taking Ginseng for years now and I notice a difference in my energy levels. If you have also been taking Ginseng and have had similar or other results please comment below.